The 2015 college football season gets underway this week and when it comes to the Big Ten there are already some interesting matchups on the slate right out of the gate. 5Dimes sportsbook has set the betting lines and totals for all of this week’s games and it has also recently updated its futures odds to win the 2015 Big Ten Championship as well as both the East and West Division titles. The team at the top of the list is the defending national champion Ohio State Buckeyes. They open this season on Saturday night against the ACC’s Virginia Tech Hokies as 12-point road favorites. The total for this game has been set at 53.5. The Buckeyes have not only been listed as heavy -425 favorites to win the East Division and -280 favorites to win the conference, they have the best betting odd in the country at +250 to successfully defend their national title. Wisconsin is the top favorite to once again win the Big Ten’s West Division at +100 and it is a +1200 third-favorite to win the conference title. The Badgers will be tested right out of the gate this Saturday night as 10.5-point underdogs against Alabama in a neutral site game at AT&T Stadium in Dallas. The betting odds for the total in this game have been set at 51. The second-favorite to win the Big Ten this season is Michigan State at +950. The Spartans’ betting odds to upset the Buckeyes for the East Division title has been set at +670. 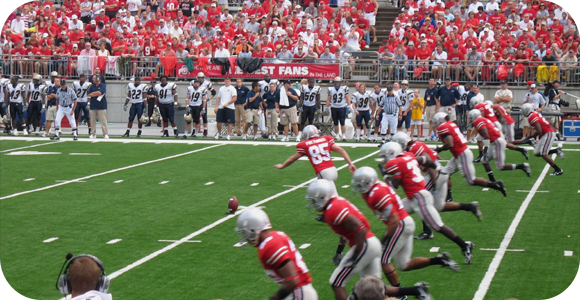 They will kick-off their season on the road against the Western Michigan Broncos out of the Mid-American Conference. Michigan State has been listed as an 18-point favorite with the total set at 58.5. Some of the other top games on the Big Ten schedule in Week 1 starts things off with Minnesota playing host the Big 12’s TCU Horned Frogs this Thursday night. The Horned Frogs are +180 favorites to win the Big 12 this season and they are +1100 third-favorites to win a national championship. The Golden Gophers have been listed as 14.5-point underdogs against TCU with the total set at 58. Their betting odds to win the West Division are set at +615 and their odds to win the Big Ten this season are set at +4500. The Nebraska Cornhuskers are +253 second-favorites to win the West this year and their odds to win a Big Ten title are set at +2000, which are fourth-best on 5Dimes’ futures list. They will be back in action this Saturday against BYU as seven-point home favorites with the total set at 64. This week’s top pick in the Big Ten takes us to Joan C. Edwards Stadium where the Marshall Thundering Herd will play host to the Purdue Boilermakers in a special Sunday afternoon matchup on Fox Sports 1 in a scheduled 3 p.m. (ET) start. The Boilermakers come into this Big 10/ Conference USA matchup as 7.5-point road underdogs with the total set at 63. Last season they stumbled down the stretch with six straight losses while going 2-3-1 against the spread. Marshall on the other hand turned-in an impressive 13-1 mark straight-up while going 8-5-1 ATS. The Thundering Herd are a profitable 10-3 ATS in their last 13 home games. They had one of the most potent scoring offenses in the country last season with an average of 45.6 points a game. Purdue had its issues keeping opposing teams out of the end zone in 2014 with a defense that allowed an average of 31.7 points a game. While there may be a major stepdown between the Big Ten and C-USA in general, I am going with Marshall in this matchup to win and cover as one of the best teams in its conference facing a Purdue team that is predicted to finish at the bottom of its conference.